Please fee free to share this invitation with family and friends. Curated by current Fountainhead Resident Giscard Bouchotte. For the full program, head to the Tout Monde Festival website. Please join us as we get a sneak peak of the (RED) auction and galleries in Little Haiti before the international art world floods in. Meet us at the Moore Building 191 NE 40th St, Miami, 33137. 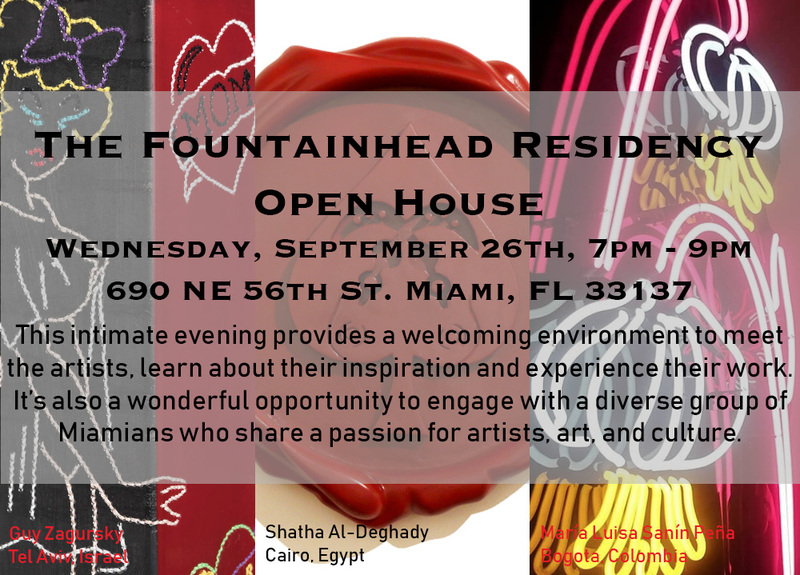 This is a private event open to YoungArts Patrons and Fountainhead Visionary Members. To learn about membership please click here. Not a member? 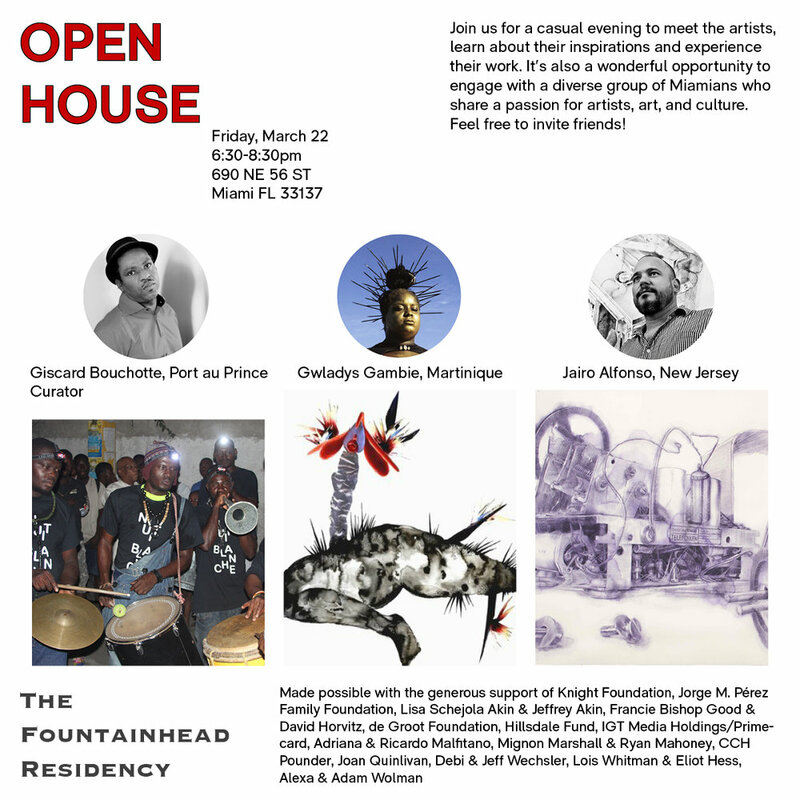 Tomorrow night, Friday, October 26th is our free, public Fountainhead Residency Open House. Everyone is welcome! This event is open to Fountainhead Major Donors and Fountainhead Experience Benefactors and Visionaries. Please don't miss this curatorial debut of Rachel Lee, Fountainhead intern, featuring her fellow New World School of the Arts Alums and their mentors. 10% of all sales will be donated to NWSA BFA program. The building is located directly across the street from Wynwood Arcade. Please enter through the landscaped parking lot. You are welcome to park for free in the parking lot. 24th St is a one-way street that must be enter from NW 2nd Ave if coming by car. We want to give special thanks to our partners who supported us in bringing our current artists: Tami Katz Freiman and the General Consulate of Israel in Miami with Guy Zugarsky; The Ministry of Culture of Colombia with Maria Luisa Sanin Pena, and The Africa Centre with Shath Al-Deghady. The Fountainhead Residency values and appreciates our generous donors: Jorge and Darlene Perez Family Foundation, The John S. and James L. Knight Foundation, Lisa Schejola Akin and Jeffrey Akin, Francie Bishop Good and David Horvitz, The de Groot Foundation, The Hillsdale Fund, Adriana and Ricardo Malfitano, Mignon Marshall and Ryan Mahoney, and Alexa and Adam Wolman. Please join us as we explore 7 galleries in Little River: Mindy Solomon, Tile Brush, Dot Fifty One, Pan American Projects, Nina Johnson, & Gallery and Emerson Dorsch. It may sound ambitious but luckily they’re all within 2 miles. 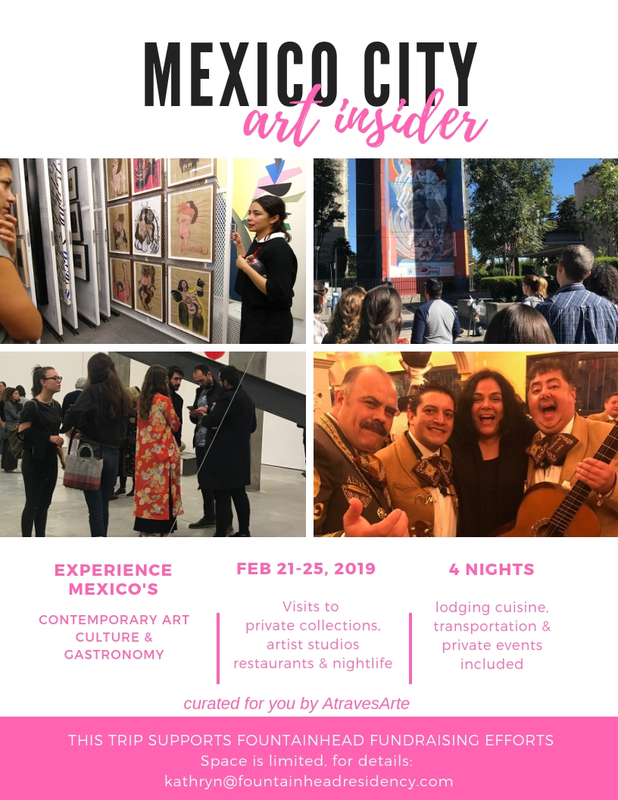 This is a wonderful opportunity to not only explore local galleries but to truly understand the work you’re seeing and the artist’s inspiration and process behind it. All the gallery owners will be there to walk us through each show. 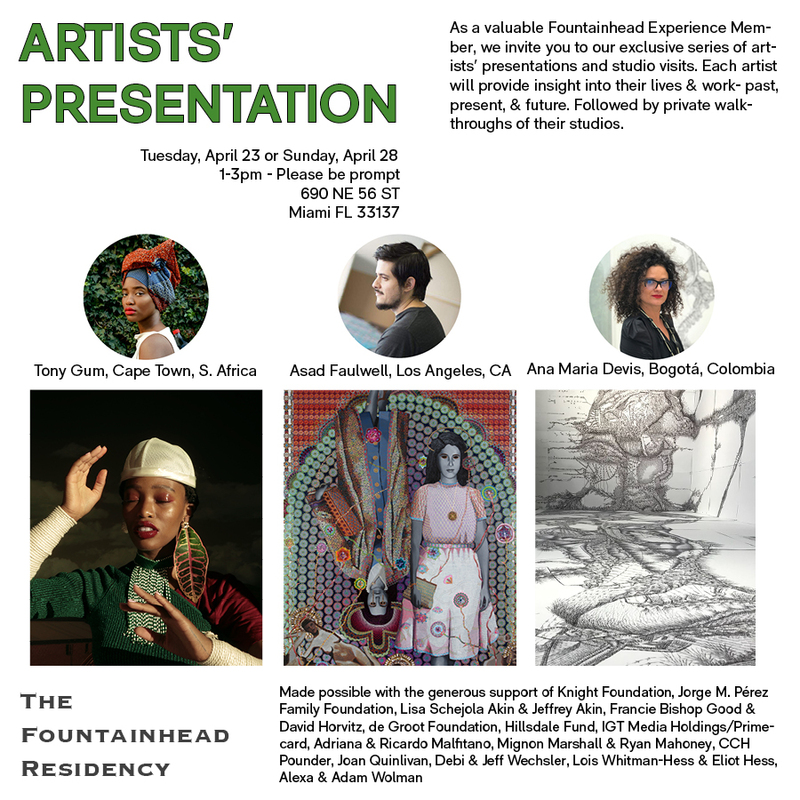 Visiting Fountainhead Residency artists will be with us so you’ll be able to meet them and hear their unique perspective.